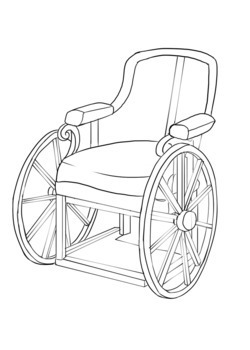 Some historians have even suggested that because the earliest evidence of chairs and wheels dates from around 4000 BC, The first clear proof of a wheelchair, however, is from a Chinese image engraved in AD 525. A sketch of the King Philip II of Spain drawn in 1595 shows him seated in a chair that had small wheels mounted at the end of each leg. Features of the chair included a raised platform for the King’s legs and an adjustable back rest. King Philip’s chair was not self-propelled; he relied on a courtier or servant to push it. The first recorded instance of a disabled person with independent mobility was in 1655 when Stephen Farfler, a paraplegic watchmaker, built a robust-looking chair on a three wheel chassis. Attached to either side of the single front wheel were handles that Farfler turned to propel himself forward. In 1783 John Dawson developed a wheelchair in Bath, England, where many invalids travelled to drink and bathe in the spa water. Dawson’s “Bath” chair, with its third wheel that the occupant could steer by using an attached rigid handle, was a great success. There were a number of versions, some of them open, some with hoods and glass fronts, but they all had to be pushed from behind or pulled by a small horse or donkey. During the nineteenth century, wheelchairs became less cumbersome and more comfortable. As a result, some users were able to turn the large rear wheels with their hands, although this could be unpleasant if the chair ran through a patch of mud. The problem was solved in 1881 when manufacturers began to add a second rim with a smaller circumference to each wheel. These rims kept the hands clean and were known as push rims. By the beginning of the twentieth century, wheelchairs had developed still further and boasted wire-spoke wheels, adjustable seat backs, and moveable arm and foot rests. There were also lightweight models made of wicker mounted on metal frames. By 1916, British engineers had produced the first motorized wheelchair, although the majority of users remained in manual versions, which were becoming much cheaper. Despite this, the chairs were still rigid and difficult to store and transport, particularly in cars. But in 1932, a Los Angeles engineer named Harry Jennings designed and built a folding wheelchair for his friend, Herbert Everest. The two men immediately saw the potential for this invention and established a company to mass-produce the new portable chairs. These were the forerunners of the wheelchairs in common use today. Early chairs were made of wood, were very heavy by today's standards, and had tall backs. They provided very limited mobility; most users couldn't even push themselves and had to rely on other people to wheel them around. Early power chairs used belts in the drive-train. The motor turned a rotor which had a belt wrapped around it, and the belt transmitted the power to the wheels. Today's chairs use direct drive, meaning the motor turns gears which in turn move the power through a gear transmission to the wheels. Direct drive is more reliable and needs less maintenance. (Power chairs were actually once called “electric chairs”, until marketers realized that the public thought of electric chairs as machines of execution.) The early power chairs were manual chairs with batteries and drive mechanisms jury-rigged on. The chairs were bulky and difficult to navigate with. Designers have since fixed those problems, and modern power chairs have all their elements integrated into a coherent system. While the first power chairs used electric power only for moving the wheels forward, today's systems include powered adjustments for seats, foot rests, back pads, and head rests. The company Everest and Jennings dominated the wheelchair industry during the mid-20th Century. They had so much market power that they faced charges of setting the prices too high, and the US Department of Justice brought an antitrust suit against them. New companies came up with innovative designs, and expanded the range of options for wheelchair users.